We are soon on our way to the emerging Disc Golf nation of Czech Republic to figure out how our beloved sport is played there. Some of the highlights of the visit include competing at the Czech Open this weekend and playing some newly designed courses around Czech Republic. One of our representatives has been promoting disc golf and DiscGolfPark™ -course design services in both Czech and Slovakia for about a year now and now it's time test the new courses build this year around the region. More info on the DiscGolfPark™ -concept at the Innova Europe -website. We will also be running a Pro Disc Golf Clinic in Prague on Friday, so if you're around be sure to stop by and get the tips from a Pro player. The clinic will held at Vypich near restaurant Ladronka starting at 16.15. The Czech Disc Golf Association wishes all attendees to pre-register and there are only 20 spots available, so go fill that form quickly if you want to join in! Lastly we'd like to congratulate Team Discmania's* Avery Jenkins and Will Schusterick who were placed 5th and 4th at the PDGA Championships last weekend. Both guys played really solid tournaments despite the though competition in this year's last Open Major. 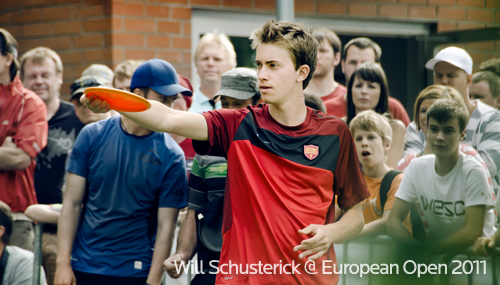 Congrats especially to Will Schusterick for top 4 finishes in all of the Major tournaments (Pro Worlds, European Open & PDGA Championships) this year!